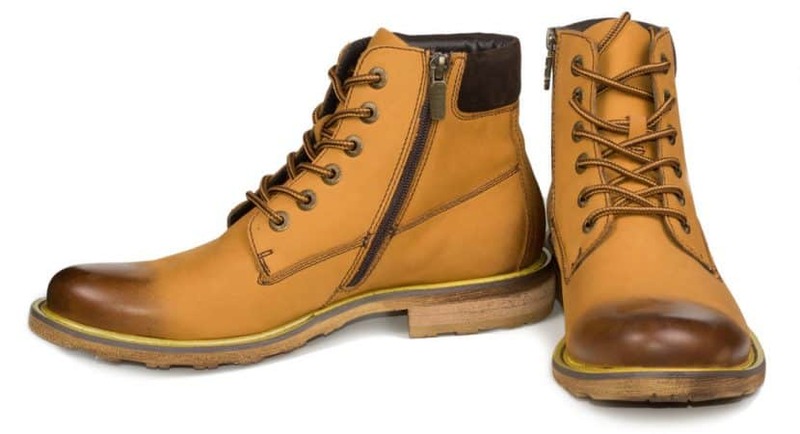 Sometimes you might just feel like switching things up a bit and swapping your regular shoes for a pair of versatile, increasingly popular men’s dress boots. We’ll discuss the various kinds of dress boots you can purchase as there has been a real revival of this category of footwear, so it’s worthwhile doing a little refresher course on the difference between a Chukka and a Chelsea. Safe to say that some will look better with your relaxed denim off-duty look while others can be paired rather elegantly with a suit for a smart casual business attire outfit. Knowing which to wear with which is important, but as long as you bring your own sartorial style and confidence to the table, you can probably pull off just about any ensemble. How to wear dress boots in essence really does depend upon what kind of boots you’ve invested in. From Brogues to Derby boots, Oxford all the way to Chelsea we’re going to walk you through a couple of do’s and don’ts of these iconic and dependable shoes so that you’ll have your finger firmly on the fashion button. The Chelsea boot is a great option if you’re looking to upgrade your work wardrobe with something a little bit more fashionable, and also durable and comfortable in the colder weather months too. Chelsea boots really do make a smart and stylish choice when teamed with a classic suit and are a safe and reliable option that won’t have you committing any fashion faux pas. Thanks to their smooth, slip-on design, these are an elegant choice and perfectly complement rather than overpower an outfit. This dress boot is super versatile and can be teamed with an endless range of outfit choices from casual jeans and T-shirt combo, to adding an unconventional twist to traditionally more formal attire. Pick out a pair in either classic black or brown, and you will be able to sport them with a wide range of other color choices too. In leather or suede, the suede option is great for toning down a look and giving it a less polished and more casual overall finish. Consider a pair of highly shined black smooth Chelsea boots with a pair of skinny fit jeans for a real modern look. A pair of Oxford boots is an excellent wardrobe staple and makes the perfect dress boot in black or brown for many a formal occasion. They tend to be neater and more compact than their equally stylish counterparts the Brogue and the Derby boot and have an overall slimmer design aesthetic usually with a shined leather construction, eyelets and subtle detailing to enhance the refined look of this particular boot. They can of course also be made from a wide range of other fabrics including canvas and suede, as well as leather which is what makes them such a versatile choice. Brown leather Oxfords will perhaps provide the most formal look and are great worn with a navy blue sharply tailored suit. Although they may well be called dress boots, an Oxford in a pale-colored canvas, for example, makes a very chic and casual fashion statement and looks excellent worn with jeans or even with linen trousers for a lightweight smart casual summer look. The Derby boot is another great men’s dress boot option if you want to carry off a more polished look by combining with a suit. If you are going for a very smartly tailored look, then stick to a classic Derby in just a plain black or brown to complete the sophisticated look. A shiny pair of brown Derby boots in the winter also looks great when worn with a pair of navy jean, a simple white T-shirt, and a smart coat or mac. If you really want to stand out from the crowd though, consider buying a pair of Derby boots in a softer tone like a grey or burgundy. These kinds of colors can add a gentle but very effective pop of color your winter wardrobe and Derby boots of course also look just fabulous with tweed fabrics too. The Brogue is a truly versatile and chameleon-like men’s dress boot which can come in all kinds of simple to elaborate colors, materials and with enhanced detailing. A smooth and simple, clean and classic pair of Brogues are just the thing when you want your outfit, not your feet, to be the star attraction. The lace-up design is easy to wear and means these dress boots are also an obvious winter choice. Brogues have been popularized by brands like Hudson and Gregson, and they really do look stylish worn with jeans. Consider rolling your hem up even in order to accentuate and show off your Brogues. Another timeless and always easy to pull off look is to team a pair of classic Brogues with jeans, a graphic T-shirt, and a blazer combo or a T-shirt with an open lumberjack shirt. For our final recommendation on how to wear dress boots, we’re considering the Chukka boot. Also known as the desert boot it was introduced during WW2 by a British soldier, Nathan Clark as a lightweight alternative to the military boot. It just so happens that Nathan’s father owned a shoe company, which became Clark’s, and the desert boot was well and truly alive and kicking. Chukka boots go with just about anything and are a stylish and versatile choice. Typically constructed from a lighter suede, they’re the most relaxed and casual looking of all the dress boots so work incredibly well with jeans and a light colored top for a fresh and flattering vibe.